Before you contact your travel agent or get on a set tour, allow me to share our DIY (do-it-yourself) Bangkok trip for our fourth year anniversary. Silom is like Quezon Ave. or Ayala Ave. here in Manila. As I've said earlier, we had free accomodations in Bangkok--in Silom City Hotel. How we got it for free? I'll reveal that in another post. Silom City Hotel is not exactly along Silom Road but on one of its side streets, Soi Prachum (Soi Silom 22). "Soi" means an side-street branching off a major street (called Thanon). It took us a long time to find the hotel's address since we were looking for a street sign labeled "Soi Prachum" as it was the one stated in the hotel's card. We learned that it would have been easier if we look for "Silom 22" instead. Just a tip on looking for streets in Bangkok: When walking on the major street towards increasing soi numbers, all the even-numbered sois are on the right side and the odd-numbered ones on the left side of the street. When you look up the above hotel in Tripadvisor, you'd see numerous reviews about it, mostly negative. I'd say: Ignore them! Silom City Hotel is a nice, small hotel---not as big and as busy as a major hotel chain but I won't consider it as one of the seedy ones either. If you'd ask me to compare it to a hotel here in Manila, it's similar to City Garden Hotel or Executive Plaza. What's Hot & ; Not with Silom Area? Silom is "tourist-safe." It's not too busy and not too laid-back either. Also there were no hawkers and touts on the lookout for foreigners to, ugh, victimize. Lots of establishments to suit your needs: malls, pharmacies, eateries, souvenirs---name it, it's there! 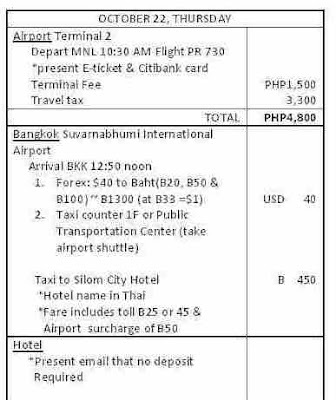 The downside is Silom is quite far from the famous BTS (Bangkok Mass Transit System or Bangkok's MRT). 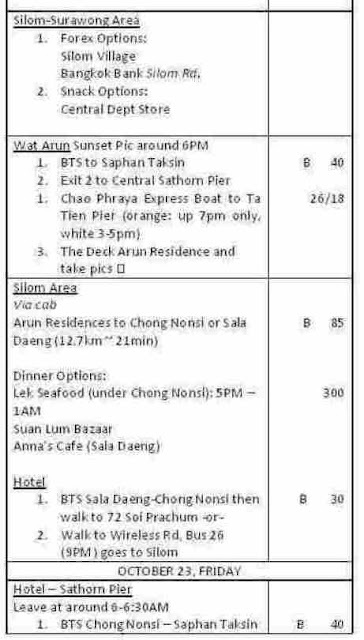 In our case, the nearest BTS station which is Surasak is a 10 minute walk from the hotel. Definitely "walkable," but after all the tour around Bangkok area, temples and malls, you'd definitely wish that the BTS station was just a few steps away from your doorstep. 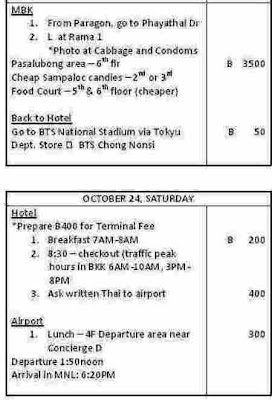 If I were to plan a Bangkok trip again, I would choose a hotel or hostel within a BTS station or location a few blocks away. I will talk more about this future Bangkok game plan in a later post. It's near Soi Patpong---Bangkok's red light district. I don't know if it's considered "hot" or "not" --- depends on the person I guess, hehe. For first-hand experience on Thai's fresh produce, we found this market around Soi Silom 20. Let me recommend this restaurant along Central Silom (same area as Tops Supermarket). It's Lee Cafe. Lee Cafe marked my first stop for our "search for the best, yet cheap phad thai" themed trip. Dishes usually range from 100 baht up. My take on Lee Cafe's phad thai? It was good--definitely better than what they serve here in Manila (Jatujak, Oody's). After the first taste, I almost wanted to say, "Now I know how an authentic phad thai should taste like!" But I have to remind myself that it is too early to say that. 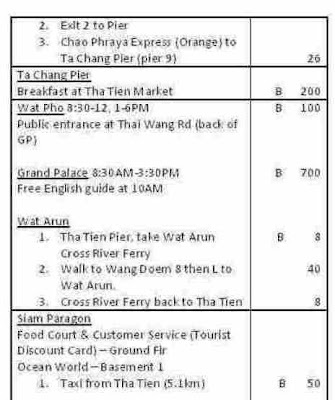 We're set to eat different phad thai versions as much as our stomach can tolerate hehe. More phad thais and behind the scenes on our Bangkok DIY itinerary next time! Kailangan pa talagang pumunta sa thailand para sa phad thai na 'yan. Nung matikman ko kasi ang phad thai sa bangkok, ibang-iba sa phad thai dito kahit sa mga "authentic" kuno na thai resto. Thuk Thai in Ortigas tastes "authentic" somehow. Badtrip yung sa Som's...authentic daw...bleah! Guests House is one of the accommodation of hostels, A home offer rooms and house of the travelers. as I'm planning to create my own blog and would like to learn where you got this from or what the theme is called. Appreciate it! Excellent post. I used to be checking constantly this weblog and I'm inspired! Very helpful info specifically the closing part :) I maintain such info much. I used to be seeking this particular information for a very lengthy time. Thanks and good luck. I'm really impressed with your writing skills as well as with the layout on your weblog. Is this a paid theme or did you modify it yourself? Either way keep up the excellent quality writing, it is rare to see a great blog like this one nowadays. I could not rеfrain from сοmmenting. Perfeсtly wгitten! vast for me. I'm having a look ahead to your next post, I will attempt to get the dangle of it!